If someone were to ask “what is jazz?,” you might be tempted to play some Art Tatum or Oscar Peterson to illustrate the energy of swing, some trios of Bill Evans or Keith Jarrett to illustrate the elegant empathy of collaboration, some Charlie Parker or Herbie Hancock to illustrate the intricacies of improvisation, some Dave Brubeck to illustrate the elasticity of time, some Ornette Coleman to illustrate the freedom of expression. Or you could just bring on the Stanley Clarke Trio with Hiromi and Lenny White. With unbridled energy, empathetic interplay, and creative attacks on melody, rhythm and time, they redefined and reaffirmed the modern jazz trio for enthusiastic audiences at the Dakota this week. Clarke and White, already legends on their instruments, were seemingly rejuvenated by the legend-in-the-making Hiromi Uehara. Individually and together, they offered plenty of razzle dazzle, not as a self-conscious conceit but as a natural expression of their delight in each other’s company. Just a month earlier, Clarke and White lit up the Dakota stage with their Return to Forever cohort Chick Corea, and up to that point it surely ranked as one of the top acts at the club in the past year or beyond. 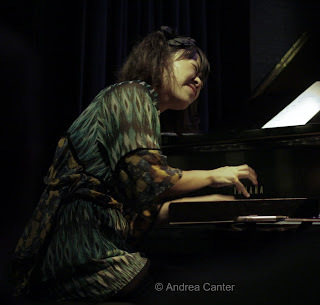 Yet something about the Tatumesque chops, youthful recklessness and child-like glee of 28-year-old Hiromi pushed her elders to another level of spontaneity, of pure musical fun. Not only must I confess to enjoying Clarke and White even more in the company of Hiromi, but I enjoyed Hiromi more in the company of Clarke and White: Leaving behind the interesting but sometimes abrasive electronic experiments of her Sonicbloom quartet, she relied on what I have always admired most in her music—an electrifying, all-acoustic eclecticism where “fusion” means melding elements of classical, stride, avant garde and her native Japanese traditions. Of course Stanley Clarke’s near mythical status is rooted in his pioneering work on electric bass, and the trio’s recent Jazz in the Garden is his first all-acoustic recording. If acclaimed for bringing an acoustic approach to the electric ax, today he is bringing the endless palette of electronic sound to acoustic upright bass, as well as the (seldom played in jazz settings) acoustic bass guitar. Stanley Clarke could be a one-man band, but he so clearly enjoys his position between piano and drums, where he can both direct with a slight nod and acknowledge with a broad grin. The Dakota sets were filled with grins and laughs, on and off stage. 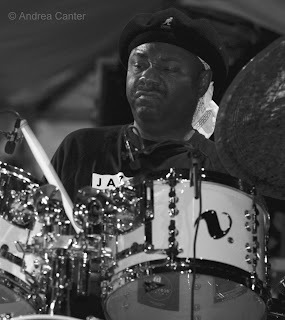 Lenny White spent years bringing volcanic action to rock fusion, but there’s an equally compelling jazz drummer behind the trapset. White’s contributions are neither too subtle nor too demanding, his solos offering any wannabees lessons in the dynamic use of restraint and purposeful release of energy. But if the individual performances were the lava, the interplay among the trio was the molten core. What is jazz? Improvisation, collaboration, spontaneity, rhythmic drive, cultural integration? 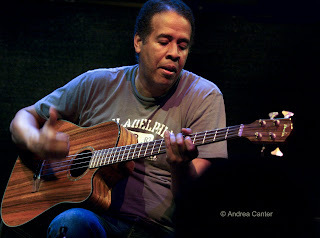 The Stanley Clarke Trio.